Here is the list of the volunteer work that Dynasty staff and students (listed by the camp week they attended) reported in 2017! This is GREAT STUFF! I am proud of all of you — you guys inspire me to do more!!! If you were a 2017 student/staff that did volunteer this year and your name isn’t on this list it is because you didn’t email me! I can’t report on something I don’t know! Please email me so I can update! traveled to raise awareness! Megan was given a last minute opportunity to climb Mt. 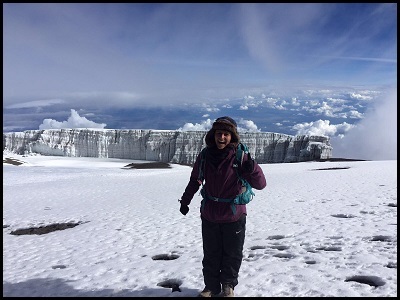 Kilimanjaro (she literally had about a week to prepare for a trip halfway across the globe!) in June with the Equal Playing Field Initiative. EPF strives to raise the awareness of gender inequality in sport and to promote sports development for girls and women globally, especially in marginalized countries. 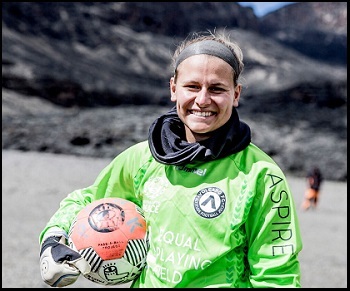 Not only did the EPF crew summit the tallest mountain in Africa, they broke the world record for the highest elevation regulation football match in history at 5714m. The two teams consisted of 32 female players from grassroots to the elite, represented 20 different countries and ranged from 15-55 years old. On June 28, I flew to Tanzania to join the group of 60 people, including the teams, referees, medical and support staff. We spent the first 6 days climbing up the mountain before our final campsite. We had a 7v7 scrimmage on day 3 at a high enough altitude to break the record, but we did not have the space for a FIFA regulation field. The big day was easily the most difficult thing I have experienced, both physically and mentally. 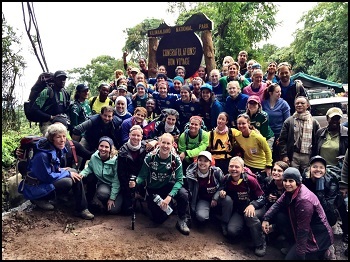 We woke up at 2am for a bowl of porridge before climbing slow and steady (“Pole Pole!” as they say in Swahili!) up a steep incline for FIVE hours. Our hydration packs froze and we had just our headlamps for light until the sun rose about 4 hours into the hike. 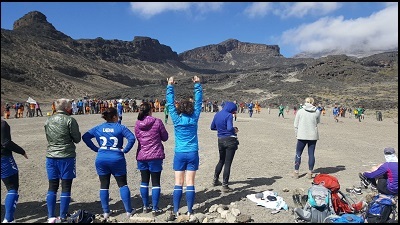 Once we reached Stella Point (the point just above the crater where we would play the match), we had a quick rest and bowl of soup while our awesome crew set up our FIFA regulation pitch. The match began and I have never been more grateful to be a goalkeeper. Any 10 yard run got you out of breath and these players were sprinting in bursts, competing just as hard as they would if it was a regular altitude (with a bit more walking recovery). The match ended in a 0-0 tie with multiple chances for both teams, but we all celebrated because we knew we had completed the record breaking match! However, the day was not done! We were cleared by medical staff to do the one-hour climb to the highest point of the mountain. We got our pictures and headed back down to camp (2-3 hour descent). Ping on top of the world! cultures around the world. While I know there is still work to be done in our professional leagues in America, the fact that we are able to play and compete whenever we want is something we should be grateful for. This group of people has inspired me by their daily efforts to achieve opportunity, equality and respect for women around the world. Please check out the documentary, website and gear for purchase! The crew is planning their next world record and putting on clinics around the world to continue their impact on women in sport. 2017 did not present any opportunities for me to volunteer abroad, so instead I chose to focus locally and do what I do best, coach! In the spring I volunteered with Chapel Hill High School to coach the goalkeepers on the girl’s soccer team and in the fall I helped train the goalkeepers on the boy’s squad. Due to travel, rehab, and work commitments in coordination with a VERY full high school game schedule I was only able to coach the girls in April/May for three sessions (~6 hours) and the boys in October for 3 sessions (~ 6 hours). I enjoyed being able to coach the goalkeepers in a team environment, help sharpen their skills, and boost their confidence right before playoffs. Mainly I appreciated seeing the excitement of the goalkeepers when I arrived at the field as they realized on that day they would get some much needed attention and gk specific training. In addition I appreciated how welcoming the coaching staff always was considering how sporadic my presence was. They were genuinely thankful for any time I could commit and super flexible. It was a nice reminder for me that even a small gesture of time can make an impact, so never feel like a small commitment isn’t enough. From my perspective it was also a lot of fun to work with two athletes whom had never played the position before! On the girls team we had a senior volleyball player come out for the season and on the boys side we had a senior baseball catcher join the squad. Both had great attitudes, picked up techniques quickly, pushed the starters, and contributed a LOT to the team chemistry and camaraderie of the “goalkeeper union”. Also of note the Chapel Hill Boy’s won the NC 3A High School State Championship this fall after being runners-up in 2016, so it was fun to play a tiny role in helping “Wolfie” peak at the right time. Overall, whether I am inspiring girls running a session in a third world country or building confidence in the goalkeepers in my own community it is always a gift to receive a genuine smile in exchange for my time. 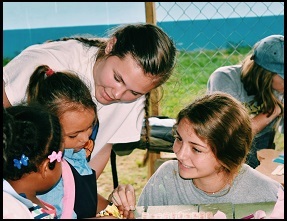 Emily participated in three service opportunities along with her college team at Wake Forest University this past fall. In pre-season they pitched in to help HOPE (Helping Our People Eat) driving around low-income neighborhoods in Winston-Salem delivering groceries and lunches to around 65 families (4 hours). 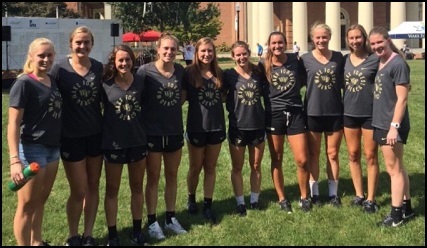 At the end of September Emily and her teammates were back at it with “Hit the Bricks”, a charity run around the quad on campus with bricks in their backpack. Hit the Bricks is an event that raises money to help find a cure for cancer! (1 hour). I love that Emily and her teammates have a team goal of 27-30 hours a person by the end of the academic year. She said they plan to do a lot more work in the spring when their schedules are more flexible. Given all the demands of a D1 college student-athlete I appreciate that they have made it a priority to be involved in the community! Red Cross: (7 hours) At the Red Cross, Sarah helped others sign up for donating blood. She also helped coordinate between her high school and the Red Cross to host a blood drive on November 17th. Elkhorn South High School: (22 hours) Sarah volunteered with the girls’ basketball team at Elkhorn South for their summer basketball tournament. She kept time and score for their games. Elkhorn Soccer Club: (34.5 hours) Sarah assisted by keeping time for a few summer scrimmages and also helped register teams for the Elkhorn Summer Classic tournament, transported handicapped fans from field to field, worked on the fields to keep track of scores, and cleaned up after the tournament. Westridge & Manchester Elementary: (8 & 9 hours) Sarah helped with before school planning at both elementary schools. She sorted papers alphabetically and made agendas and nametags for fifth-grade students. 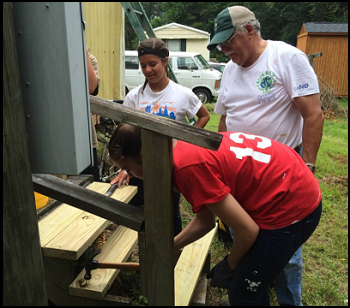 Gabi logged an impressive 58 hours of service work with the Food Bank of Central & Eastern North Carolina this year. As a volunteer she works to do packaging and labeling of food at a local food warehouse. All the food at the foodbank is donated by grocery stores and farmers. The food ranges from frozen peas, bananas, potatoes, cucumbers to pasta. All the food that is packaged and labeled is sent to shelters, local soup kitchens, and churches for those in need. 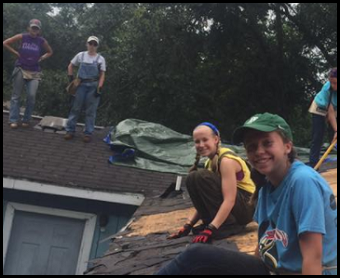 In total Paige committed 40 hours of service work during her trip. Stephanie participated in two local organizations this year, Mentor’s Club and Matthews Help Center. 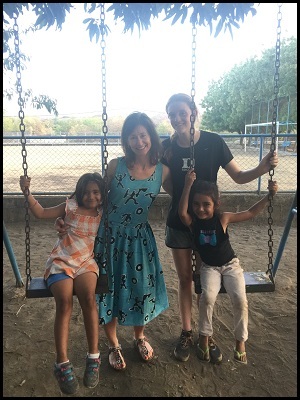 She volunteered 2 hours with the Mentor’s Club, an after school ‘camp’, where she helped watch and play with younger children. The Matthew’s Help Center (Helping Ease Local Poverty) created an opportunity for her to volunteer at a house doing multiple jobs such as organizing material, working at the main desk, and at the thrift store. In addition Taylor volunteered through Triangle United Futbol Club to help coach young players ages 3-5 years old to play soccer. Taylor was most excited to share her passion for the game with the young kids with hopes that they will learn to love the game as much as she does. 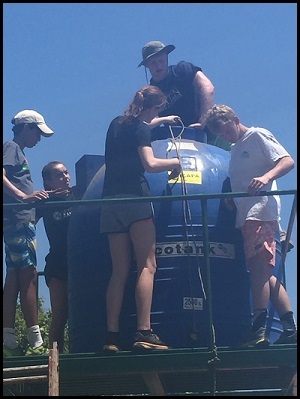 Abby helped out at Denver United Methodist Church, in Denver, NC, this past fall preparing “flood buckets” and hygiene kits for people who have recently dealt with a natural disaster. In September they made the hygiene kits which included a wash cloth, hand towel, soap, toothbrush, comb, nail clippers, and band-aids. 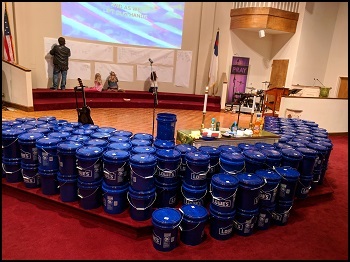 In November they made the “flood buckets” which included dish soap, rubber gloves, air freshener, trash-bags, bug repellent, cleaning brushes, work gloves, clothes pins and clothes line, and sponges. They made a total of 250 flood buckets and a total of 3,000 hygiene kits. Abby committed an hour making the hygiene kits and an hour making the flood buckets. All of the flood buckets and hygiene kits will go to people in need of cleaning supplies, body care supplies and some household items. Mackenzie volunteered an astounding 76+ hours this past year through the Boys & Girls Club of Roane County. During this time she assisted by painting gym walls, cleaning bathrooms and organizing storage closets, and putting together racks to hold various sports equipment. Georgia gave back to the hard hit area of Houston this year in a variety of ways, especially after Hurricane Harvey.